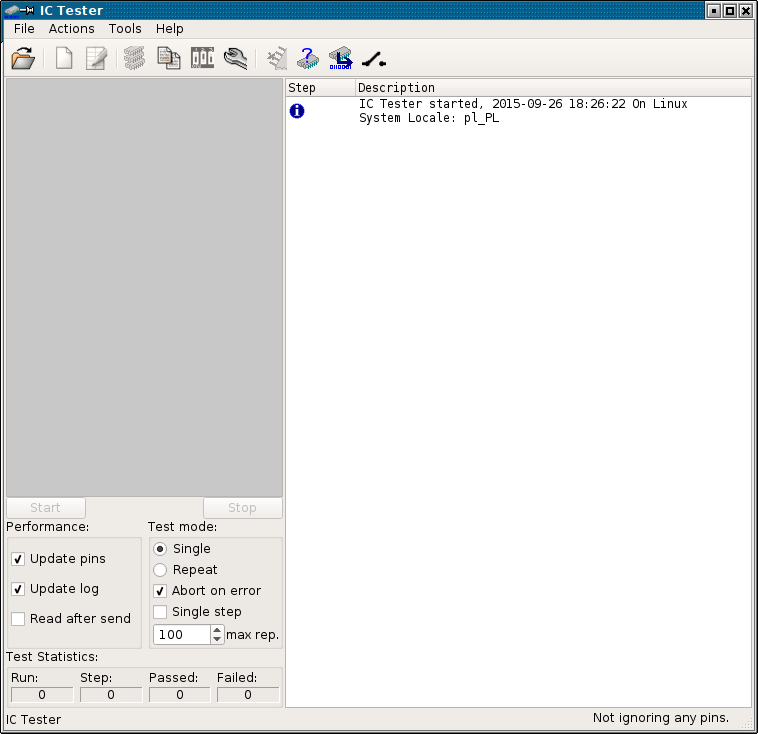 ICTester is a free (GNU GPL) set of programs which allow to use Everyday Practical Electronics' IC Tester device in operating systems other than Windows XP or earlier. Original program for this tester is written in Visual Basic thus it's impossible to successfully run it in newer versions of Windows or in any Linux operating system. ICTester is written in C++/Qt, so it's portable and can be run both in Windows and Linux environment. All configuration is stored in 2 files (.ictestrc.ini and .icpower.rc) in user's home directory. Since July 2015, it can be compiled on Qt4.8 or Qt5.x systems. The first thing you should do after installation or compiling (ICTester requires Qt libraries and QtSerialPort library, if you want to build it from sources) is to create your own directory for test sheets. 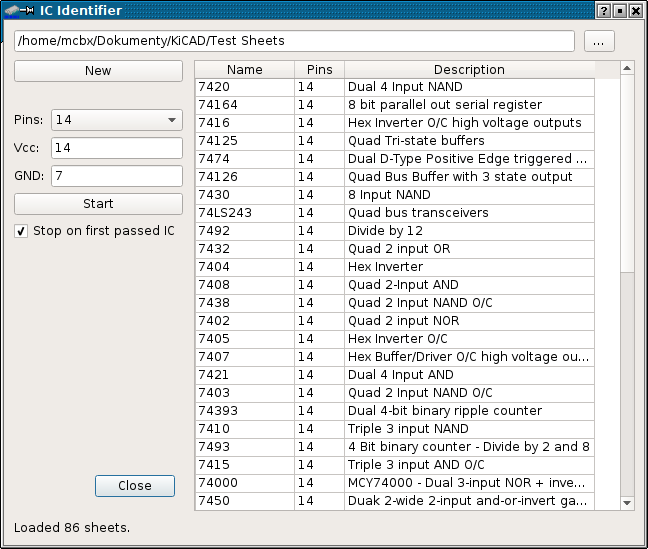 Test sheets (MOD files) are files which store test procedures for circuits. 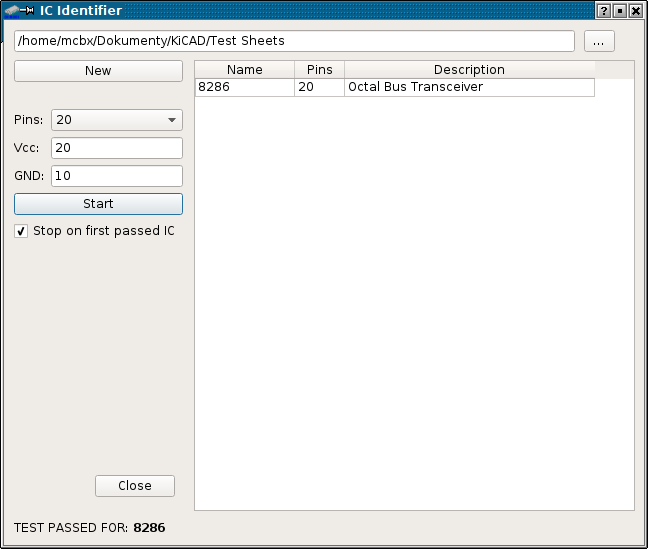 You can use test sheets from the original version of IC Tester's software. 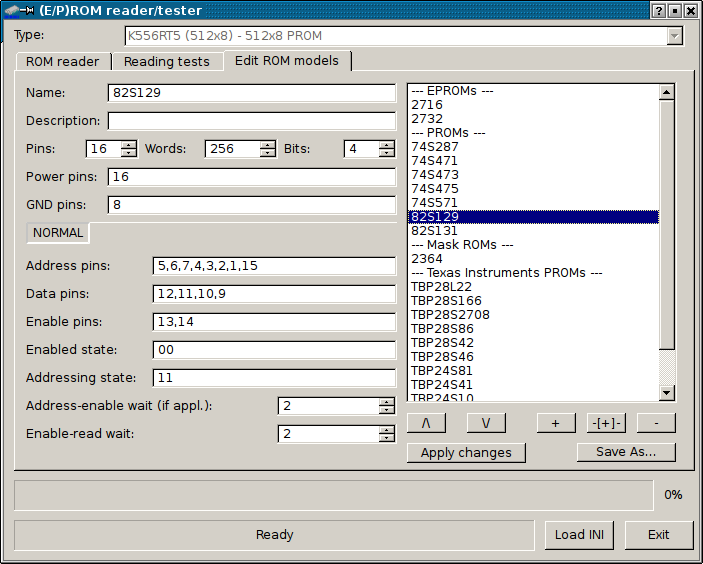 Then it's convenient to add romreader.ini file to this directory, because it contains all ROM chips definitions. This software can read ROM chip contents. To get original test sheet files, you have to download full installation (MSI) version of Windows software (e.g. from here) and install it. In Linux you have to install the software with Wine (use Wine's msiexec) and take Datasheets from their directory. The original software doesn't work with Wine 1.6.2. I recommend to create simple directory structure for different families of circuits (74xx logic, 40xx logic etc.) as it helps a lot. Then you can put test sheet files in your directory and run the program. The program's main window (shown below) consists of several parts. Toolbar and menu bar - used as in most applications. IC Preview - in the top-left part of window, shows IC being tested. If a !!! is displayed near pin, it means that error occurred while comparing to this pin. 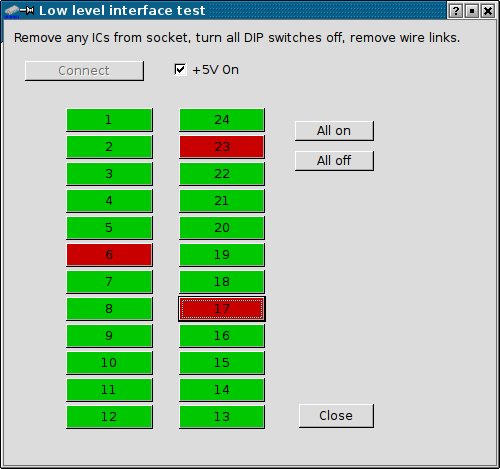 Test control panel - below IC preview - allows to specify test parameters and start/stop tests. Test log - right side of window - contains information about test steps. Status bar - contains name and description of currently loaded test sheet as well as information about ignored pins. The first thing to do here is to select your test sheets directory - it will be stored with program's configuration so you won't have to click through all directories again. Now you can select test sheet. You can quickly find the sheet by typing part of its name/description in text box above the list, you can activate the search box by clicking it or pressing / key. After you click a sheet, you'll see its preview. Confirm test sheet selection by clicking OK.
Stop - Allows to stop test any time. Update pins - if checked, IC visualization is updated in real time during test. Update log - if checked, log is updated in real time during test. During long test it may be beneficial to disable updating-related options to speed the test up. If they're disabled, Test Statistics part should be used to check is test passed or not. 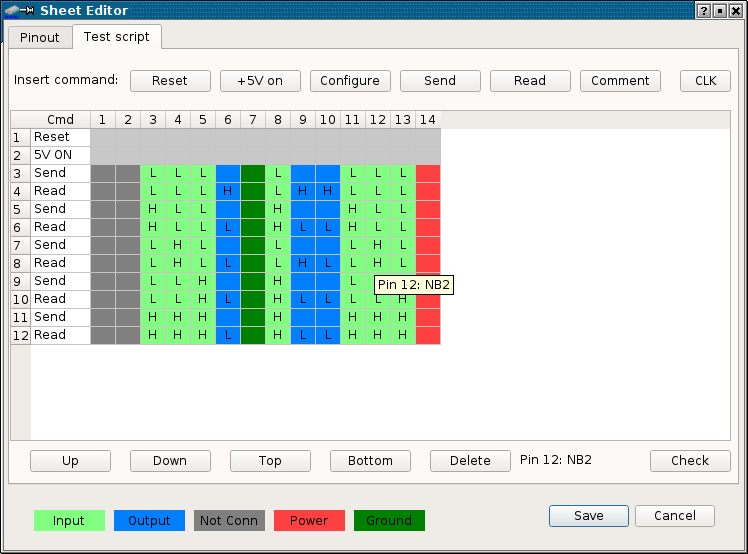 Read after send - This option performs automatic reading of IC's pins every time its inputs are changed, the result is shown in IC drawing in the main window. Together with Single Step option it may be useful in understanding chip's principle of operation or in debugging test sheets. Abort on error - If checked, the program will abort test if there was an error. If not checked, the test run is still considered as failed in Test statistics, but it's performed to the end (or end of series is Repeat is selected). Single step - If checked, the program stops after each test script's step and waits for user to confirm a window. Useful for debugging. 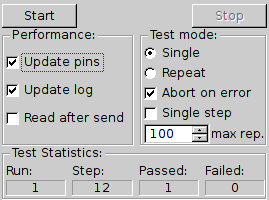 Test Statistics panel - shows number of test passes performed, current test step, number of successful and failed passes. Then you must configure your tester according to drawing and after putting IC in socket hit OK to start the test. Any time you can display current sheet's power configuration by pressing Show Power Requirements button in toolbar. As we can see from log, device (tester) was restarted, configured, power has been turned on and IC passed all checks. Notice Test Statistics counters state. - Test failed on pins 6 and 9. Error in pin 9 is marked "!!! ", which means that it failed the test. - Error in pin 6 is marked "..." which means that there was an error, but pin 6 is set as ignored (pin is marked with "X-"). - Pins marked "*" are power pins. - Pins marked with "_" are GND pins. - Pins not marked are NC. Pin ignoring can be configured from Actions menu or (since version 20150926) from toolbar button. You can program some pins (enter them as comma-separated list after selecting "Ignoring pins") not to be included in test. This is useful if you have bad IC, but you are using only good pins and want to verify that they are good in a full test. Ignored pins list is cleared every IC model loaded or if you leave blank field in "Ignoring pins" window. In rare cases it may just happen if tester is doing something other and Reset is used to interrupt. In such situation, after unsuccessful reset the tester is still "frozen" and it requires second, successful reset. -1 - Port is not opened - selected serial port does not exist, permissions problem or port is used by another application. -4 - Program's internal error in data form. If your tester hanged with power on, you can always force its reset by clicking the reset icon in a toolbar - the one with opened switch. This is quite straightforward. In this window you can change communication port to which tester is connected. And in most cases only this setting has to be changed. 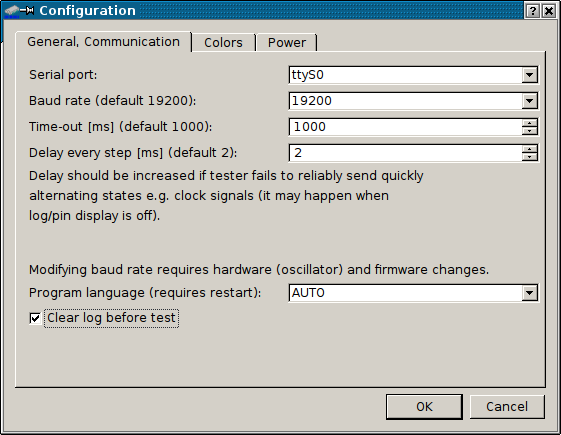 Modification of baud rate requires modification of tester itself, so it's safe to leave it at default 19200. Timeout value 1000 is suitable for most computers. If your computer is so fast that during long tests tester "drops" some commands, you can slightly increase Delay every step value. In this tab you can also point your default language. By default, the program is started in your operating system's language (or English if not accessible). This is "AUTO" mode. Using a "Program language" box you can force specific language to be used for all next program starts. You can also disable clearing log before each test. Sometimes having multiple test results one after another in a single log may misinform user, but sometimes it may be needed. 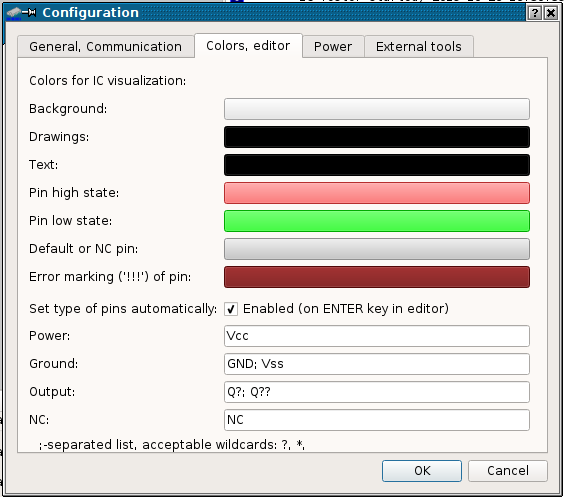 This part allows to define colors for IC visualization provided in main window. Error marking is both "!!!" and "..." if pin is ignored. This tab is very important. As you've seen by looking at IC tester hardware, Tester's board has 4 DIP switches connected to power or ground, but it can support more with user settings. For example if you check many chips in 24-pin casings, and they need power connected to pin 24, you can use 5th DIP to connect power to pin 24. This window allows to define these additional switches and they're taken to account when suggesting you power configuration before test. 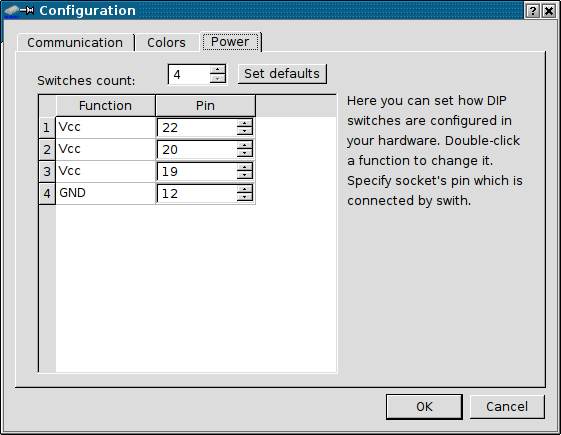 Double-click on a selected DIP switch function to change what is connected to it: Power (Vcc) or ground (GND). There may be "empty" DIP switch too, it's just disconnected so it's only drawn as present, but not used. Then you have to specify socket's pin which is connected with this DIP switch. You can always revert to default setting by pressing Set defaults button. WARNING! - bad configuration of DIP switches in program may produce misleading results in power configurations provided by it. This may cause even damage of tester or IC tested!. It is important to double-check are settings entered here reflecting IC tester wiring! - IC test script: Information how the chip should be verified. First, open any sheet from directory in which you want your new sheet to be located. This tells the active directory with test sheets. Then press the Create new test sheet button in a toolbar. Program will ask you for new sheet's name and then will go to editor. You can call editor with any sheet by pressing Edit current test sheet button. The editor consists of two tabs. In the first one you specify inputs and outputs of circuit and it should be filled first. Notice that Changing pin number erases the test script so don't make mistake here. If you change sheet's name, the file name changes too. If you've changed it, program will ask do you want to preserve file with old name. Change pin functions by double-clicking on Usage cell. You may fill Tag with pin name to make identification easier. In some operating systems pressing Return will automatically move editing to the next pin. After specifying IC details you have to program a test script in the second tab. This is a script editor. Usually most scripts start with Reset-5V ON commands. If your IC has pins which are both inputs and outputs, you can re-configure I/O during script execution. High-Low-Doesn't matter (X) states are modified by double-clicking specified cell. 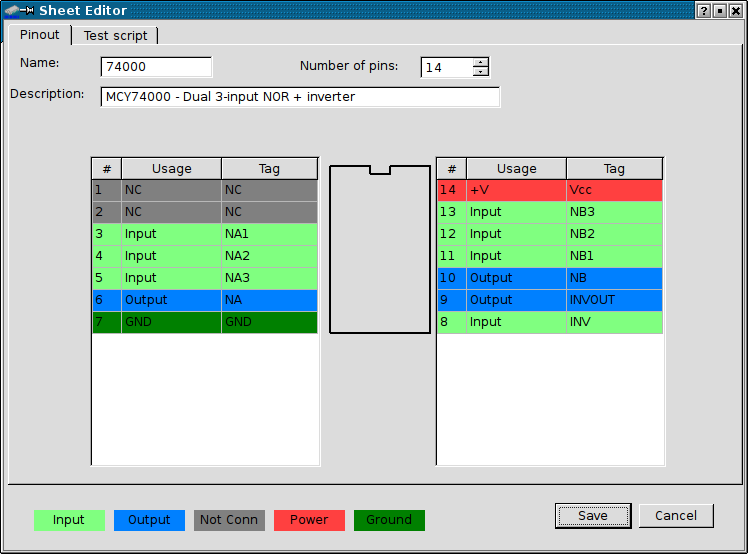 You can generate specific number of pulses (state toggles) on selected pin using CLK button. Then you are asked which pin to use and how many toggles do you want. All other pins are kept in their last state. This is useful in testing counter chips. To briefly check some issues you can use "Check" button. All output pins must be checked - are both states present on them. All input pins must be checked - does IC react on their change. All I/O pins must be checked in both directions by reconfiguration. Are there both inputs and outputs? Do all pins have the tag (name)? Does test start with Reset-Power On commands? Are all outputs verified for high and low state? Are all inputs verified with high/low state? Does test end with reading? This checking doesn't modify script nor IC design. Because PIC's lines use pull-up resistors connected with switchable +5V, it is needed to take it into account during testing with logic probe. To avoid short-circuits, remember to switch all DIP switches OFF and remove any wire links before connecting with device. To get information about tester firmware, use Identify device command in Tools menu. 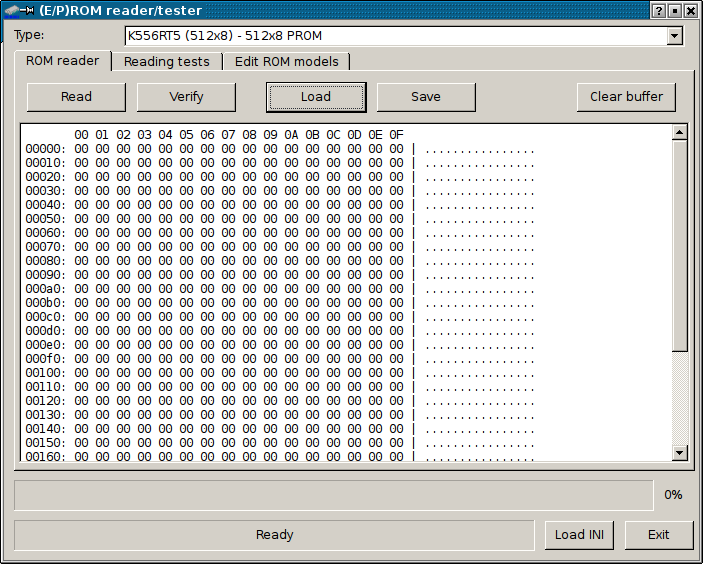 This is the newest version of ROM Dumper which has significant improvements. First, it doesn't need to be re-built to add a new chip - user may just write a new chip definition in GUI or text editor. By programming, only new reading algorithms are added. Second, this tool now allows to preform advanced read tests of ROM. This won't test the device's speed, as IC tester is quite slow, but will certainly test the read stability and access lines. The first time you run ROM dumper, You have to select the INI file with ROM definitions. I recommend placing this file near Your IC test sheets, as you may need to modify it, e.g. add reading procedure to ROM you want to read. The file name will be remembered in main program's INI file, and You will be prompted for it only when it won't be accessible. Any time, you can change default INI using "Load INI" button. Newly opened definitions file will be remembered. The software consists of 3 tabs. The first one is well known from previous versions and is used to read ROM contents to buffer, save buffer to disk, load it or clear it. You can also verify contents against buffer. The only difference between previous version is that the verification stops if any error has been found instead of completely reading chip, which makes things faster. Always the first step is to select the proper circuit from the drop-down list. For list of supported circuits read this chapter. To read circuit, press Read button. Program will ask you to set proper power setting and will read the circuit. The contents will be displayed in buffer in hexadecimal form. To verify reading use Verify button. The chip will be read with comparing with buffer. Also you can use this option to compare chip with file on disk - just Load the file from disk and Verify your chip with it. The first different byte will stop reading and the byte will be displayed in the status text. After Reading, you can Save your buffer to disk. - Read forward - is a normal verification, like the one in previous tab. - Read backward - reads ROM contents backwards, evaluating against buffer. - Random Read - reads ROM using random addresses. - Test each word at least ... times - terminates random read test (or goes to the next repeat) when all words have been read at least specified number of times. - Override waiting - allows to override WAIT parameter in chip definition. -1 turns it off. ADVANCED DESCRIPTION: WAIT parameters in ROM model determine how long (in ms) the program should wait between stuffing the address to chip and reading data, in some chips also between stuffing the address and enabling chip (some chips need to be disabled for addressing and then enabled). Default value is 2, and is good in most cases. Lower values make the chip to be read faster (which is good for reliability tests), but tester may not handle commands given so quickly. - Power cycle between repeats - This is advanced thing which reinitializes chip (turning power off and on) every specified number of words read, simulating turning power on and off. - Random power cycling - Randomly turns power off and on. Some old chips, especially soviet PROMs in brown cases like to fail right after powering up. This test should reveal problems. For NORMAL reading algorithm, there are also two additional tests. Both tests require at least one chip reading and this initial reading can be skipped by using checkbox below (buffer contents are used). Both of these tests are not conclusive, e.g. they don't indicate always that the chip is bad and their results must be analysed with knowledge about chip and its usage. Data lines test - First, the chip is read to buffer (or buffer is used). Then all words are checked if all bits change. If bits are "locked" in 1 or 0, it is indicated. Unused lines in chips may be just not programmed, or line may be bad. "Enable" lines test - The chip is read to buffer or buffer contents are used. Then one of ENABLE pins is toggled to the opposite state and chip is verified. If the result is different, the pin "passed" the test. If the reading is the same, pin is taken as "constant". This operation is performed for every pin defined as "ENABLE" or control pin. 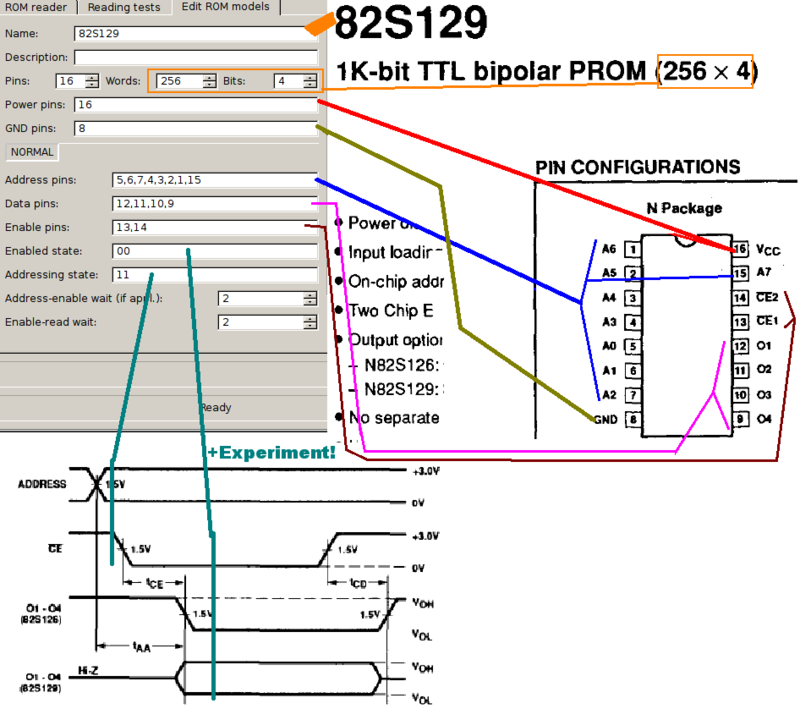 It may indicate damaged ENABLE lines, but in many PROMs there are lines, e.g. for programming, which should be kept e.g. high, but it is not compulsory. This pin will be indicated in the end of tests with a good chip. The third tab is a model editor. 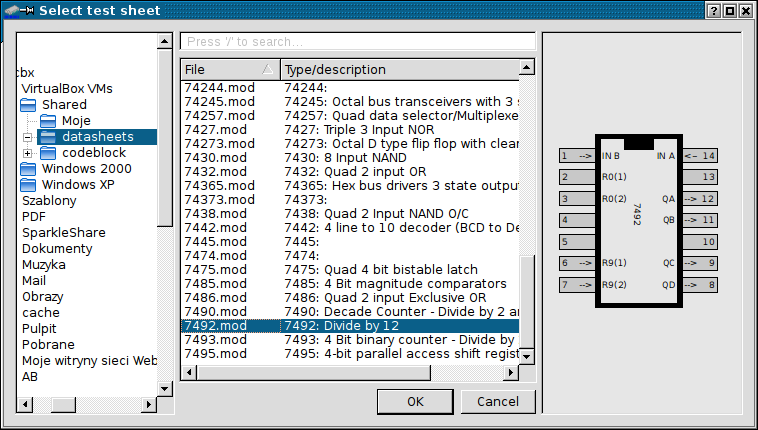 It allows user to modify or add ROM chip definitions to INI file. After applying ("Apply changes" button) modifications, modified version is used, but to be re-used after closing ROM dumper window, it must be saved ("Save As..." button) to INI file. Right side is quite obvious, allows to add, remove and order items. It is possible to add model ("+" button) or "delimiter" ("-[+]-" button), which has name always starting with a dash. If there is no dash in comment's name, program will add one when applying. These delimiters are used to splits ROM listings to nice sections for better navigation. Remember to apply Your changes after changing model settings in the editor. This is a highly experimental tool which may even damage tester or IC identified. This tester cannot detect Hi-Z (high impedance) state, so testing is made around test sheets. Although quite safe, some fragile ICs may not survive momentary current draw. Use it carefully and as fast as possible. Generally, if a chip is easy to damage with TTL pulser, don't use it in identification. at the end of [Test] section. The tool can be launched from menu or toolbar button. This tool is made to help identify chips with worn off markings. On first start-up, you have to specify a directory with test sheets. This directory is recursively searched for test sheets to test and a list is shown in right-side table. You can always change it using "..." button. The "New" button reloads sheets and makes program ready for another detection. First, it is needed to input pin number and their power requirements. It can be easily deduced from PCB how the chip is powered up. When you select pin number, the list is filtered again and default (for 90% of 74xx circuits) power settings are entered automatically. 1. List is filtered again, to make list of chips with power according to specification. If no chips are left after this filtering, the program stops here and displays message. 2. 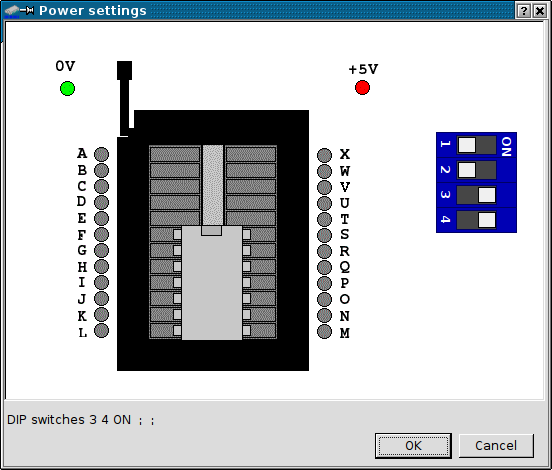 If there are chips with correct number of pins and power specification, program asks user to prepare tester, then chip is tested against all items in the list. You can see the testing in status bar and by blinking power LED in tester. By default, when test passes, identification program stops and type of passed IC is shown in the status bar. You can force test of all IC definitions by unchecking "Stop on first passed IC" checkbox. Below you can see the program after successful 8286 identification. ttySX is a serial port name. It can be separated with : and baud rate can be given (e.g. /dev/ttyS0:57600), if not, 19200 is used. There can be another value after second : (e.g. COM1:57600:3000) which is a timeout value, default is 1000.
t - normal test, asks user to configure tester and press Return. l - As above, but after pressing Return test loops infinitely (or until error/Ctrl-C). n - one pass, totally non-interactive, doesn't ask user. In such test it's important to configure tester first, as misconfiguration of power may damage chip. r - resets the tester turning power off - it you've hit ctrl-C in test and power left on. c - Low-level interface test, bit-by-bit. - ictestrc.ini is quite self-explanatory, the only thing is with colors - they're stored separately, Red-Green-Blue, value after value. - icpower.rc consists of set of lines, each line has 3 comma-separated values. The first value is DIP switch number. Second - to which is connected (0 - ground, 1 - power, 2 - nothing), third - DIP socket pin which is connected to the other side of switch. The format is the same as in original EPE IC tester. CR/LF (line endings) are the same in Linux version, Windows-like. If a line starts with # - it's a comment. Skipped during read. Empty lines are skipped too. After ignoring comments and blank lines, we have a pure script file. Now it's needed to parse it, each line has its meaning, line order is significant here. 4. Pin for + power . 5. Pin for GND - if there are more GND/power pins original software gets lost, my software proposes wire-based solution. - a - Pin number. - 2 - Universal i/o reconfigurable later? - not fully implemented. - 2 - Configure pins. This operation is usually not present in start of script, but generated from pin configuration. - 3 - Send state to pins - zero should be sent to o/p pins. It contains last save date, in YYYYMMDDhhmmss format. Next, ROM definitions are written one after other. There must be always at least one empty line between definitions. It means that is it is a category. The categories are for better ordering chip models and are not selectable. METHOD - reading method. Currently (2015.07) only NORMAL is implemented. ENABLE_PINS - comma-separated list of control and enable lines pins. Order is unimportant. ENABLE_ON - accepts only 0s and 1s. It is a digital state on ENABLE_PINS which makes the chip output data. ENABLE_OFF - as above, but it's state in which the chip can receive address. If these two are the same, chip is addressed and read with the same enable lines state. WAIT_ENABLE - time in ms between address stuffing and enabling chip. WAIT_READ - time in ms between enabling chip and reading data. If ENBALE_ON==ENABLE_OFF only WAIT_READ is used. After each definition at least one blank line must be present. The ROM dump tool can read he same ROMs that GUI, using INI files as definition sources. FILE.INI - is a path to INI file with ROM definitions. f - as above, but doesn't prompt for power requirements. 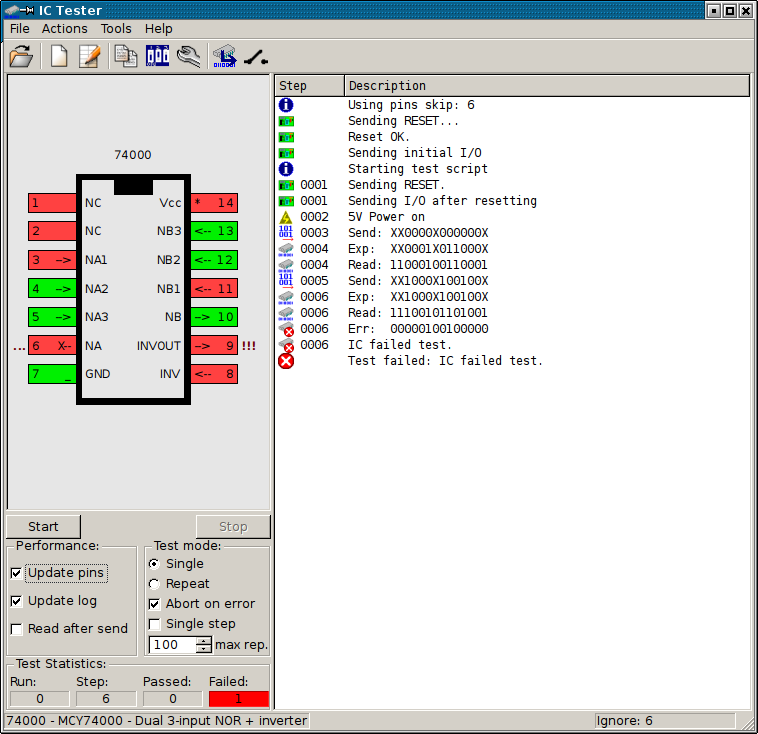 port - is a serial port for tester. It can be separated with : and baud rate can be given (e.g. /dev/ttyS0:57600), if not, 19200 is used. FILE.BIN is the ROM dump file to write to or compare with. Where PORT is port to which tester is connected, e.g. /dev/ttyS0 in Linux/Unix. It can be separated with : and baud rate can be given (e.g. /dev/ttyS0:57600), if not, 19200 is used. There can be another value after second : (e.g. COM1:57600:3000) which is a timeout value, default is 1000. There are few tests performed involving data lines test and address lines tests, which detect only some failures of address lines. To be sure that chip tested works well, verify it by few random data tests, they are performed after lines tests. In these tests the chip is filled with random data and read back - then data is compared. Tests are performed in infinite loop, so after you terminate it by Ctrl-C, turn tester's power off by re-running the program and cancelling it while it shows power settings. You should know that the tester is not very fast so it won't check for IC's speed. 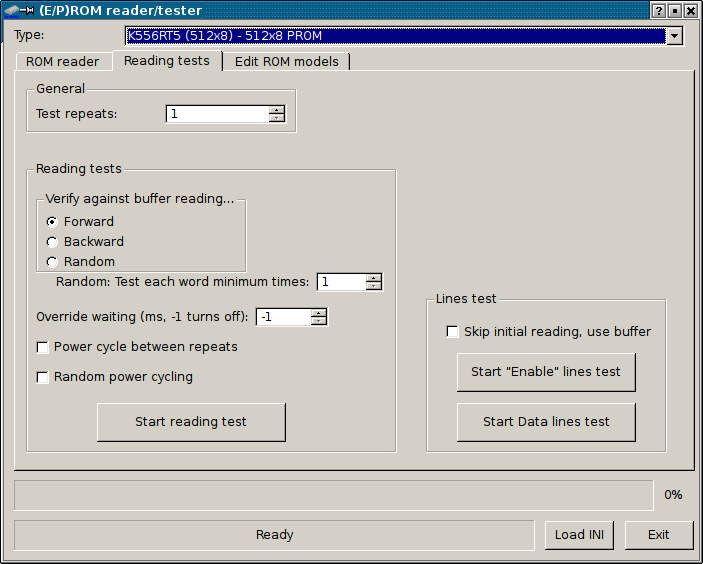 Later versions of romreader.ini file have more chip definitions. This is the end of the document.